Interior zipper pocket and double slide pockets. Double handles with 6 inch drop length. Gorgeous Burberry Smoke Nova Check “Chester” Bowling Bag. 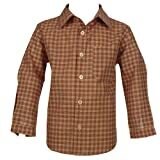 Bouton Kids Luc Dark Red Check Print Cotton Shirt for Boys. Long Sleeved with buttons and pocket to front. 100% Cotton. Machine Washable. Made in India. A really cute pattern! Better brand crisp linen check knicker set in navy check and ivory. The 5-piece set includes an ivory shirt, clip-on bow tie, pie cut cap, navy elastic suspenders, and the navy check knicker pants. 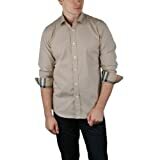 The shirt is 65% cotton, 35% polyester. The knicker pants have an elastic back. The outfit runs fairly true to size. The hat has elastic in back. Available in infant to toddler sizes, 6 month to 24 months. Made in USA. Machine washable, gentle.